The international regime of compensation for damage caused by oil pollution from tankers is based on two international Conventions adopted in 1992 under the auspices of the International Maritime Organization (IMO), a specialised agency of the United Nations. These Conventions are the 1992 Civil Liability Convention and the 1992 Fund Convention. The International Oil Pollution Compensation Fund 1992 (1992 Fund) established under the 1992 Fund Convention follows an earlier Fund created under the 1971 Fund Convention, which still exists but is in the process of being wound up. A Protocol establishing an International Oil Pollution Compensation Supplementary Fund (Supplementary Fund) entered into force on <?xml:namespace prefix = st1 ns = "urn:schemas-microsoft-com:office:smarttags" />3 March 2005. The treaty instruments have been implemented into the national law of the States which have become parties to them. The 1992 Civil Liability Convention governs the liability of shipowners for oil pollution damage. The Convention lays down the principle of strict liability for shipowners and creates a system of compulsory liability insurance. The shipowner is normally entitled to limit his liability to an amount which is linked to the tonnage of his ship. The limitation amount is 4.51 million Special Drawing Rights (SDR<>) (€5 million) for ships not exceeding 5 000 units of gross tonnage, increasing on a linear scale as a function of the tonnage to 89.77 million SDR (€100 million) for ships of 140 000 units of gross tonnage or over. The 1992 Fund compensates victims of oil pollution when the compensation from the shipowner/his insurer under the Civil Liability Convention is inadequate. The 1992 Fund is an intergovernmental organisation established for the purpose of administering the regime of compensation created by the 1992 Fund Convention. By becoming Party to the 1992 Fund Convention, a State becomes a Member of the 1992 Fund. States which are parties to the Supplementary Fund Protocol are Members of the Supplementary Fund. As at 1 June 2007, 117 States had ratified the 1992 Civil Liability Convention, and 101 States had ratified the 1992 Fund Convention. The Supplementary Fund Protocol had been ratified by 21 States. The Turkey is a party to the Civil Liability and Fund Conventions since 17 August 2002. The 1992 Fund has an Assembly, which is composed of representatives of all Member States. The Assembly elects an Executive Committee comprising 15 Member States. The main function of this Committee is to approve settlements of claims. The Supplementary Fund has only an Assembly composed of all States members of that Fund. The Funds' Secretariat, located in London (United Kingdom). The maximum amount payable by the 1992 Fund in respect of a particular incident is 203 million Special Drawing Rights (SDR) (€227 million), including the sum actually paid by the shipowner (or his insurer) under the 1992 Civil Liability Convention. The Supplementary Fund will have available an amount of 547 million SDR (€612 million), in addition to the amount of 203 million SDR (€227 million) available in the 1992 Fund. As a result, the total amount available for compensation for each incident for pollution damage in the States which are Members of the Supplementary Fund will be 750 million SDR (€839 million). 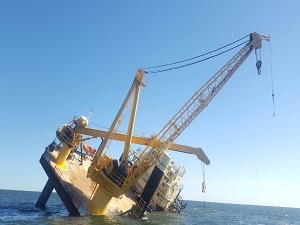 Oil spill incidents normally give rise to compensation claims for clean-up operations and preventive measures, property damage, fisheries and mariculture, tourism and environmental damage. Some of these categories can give rise to difficult legal issues, in particular as regards pure economic loss claims in the fisheries, mariculture and tourism sectors. The policy of the Funds as regards admissibility of claims for compensation is set out in a Claims Manual which has been adopted by the 1992 Fund Assembly (April 2005 edition). Decisions of the governing bodies of the Funds on the admissibility of claims and the outcome of legal actions against the Funds are set out in the IOPC Funds' website (www.iopcfund.org). In the great majority of these incidents, all claims have been settled out of court. So far, court actions against the Funds have been taken in respect of only a handful of incidents. However, the Erika incident (France, 1999), which gave rise to some 7 000 claims, has resulted in a large number of court actions against the Fund, and most of these actions are still pending. The Prestige incident (Spain, 2002) has also given rise to a number of court actions. Since their establishment, the IOPC Funds have been involved in approximately 135 incidents and have made compensation payments totalling some €730 million. The 1992 Fund is financed by contributions levied on any person who has received during the preceding calendar year more than 150 000 tonnes of crude oil or heavy fuel-oil (contributing oil) in a Member State after sea transport. The Member States are not responsible for the payments of contributions unless they have voluntarily accepted such responsibility. The contributors are generally oil companies. The main contributors are the oil industries of Japan (18%), Italy (10%), Republic of Korea (8%), Netherlands (8%), France (7%), India (7%), Canada (6%), United Kingdom (5%), Singapore (5%) and Spain (5%). The Supplementary Fund's contribution system is similar to that of the 1992 Fund. However, contributions to the Supplementary Fund are only paid by persons who receive contributing oil after sea transport in Supplementary Fund Member States. The international compensation regime is an expression of international solidarity in the sense that the shipping and oil industries share the burden of the economic consequences of tanker spills and that the oil industries in 10 countries compensate the victims in more than 100 Fund Member States. This regime is beneficial to all States, but in particular to less developed countries since their oil industries are likely to pay little or no contributions to the 1992 Fund. The regime ensures that funds are available to enable the Government and other public bodies to combat oil spills, thereby reducing the environmental impact, and to compensate individuals and small businesses, for example in the fishery sector, who belong to the most vulnerable groups of society. The present regime remains narrow in scope: it covers only oil spills from tankers. It has been used as a model for the adoption in 1996 of a Convention on liability and compensation for damage caused by hazardous and noxious substances (HNS Convention). When it comes into force, the HNS Convention will create a system very similar to that under the 1992 Conventions, including the establishment of an international fund maintained by contributions from receivers of hazardous and noxious substances to pay compensation for damage arising from incidents involving such substances. <> The unit of account in the Conventions is the Special Drawing Right (SDR) as defined by the International Monetary Fund . In this paper, the SDR has been converted into Euros at the rate of exchange applicable on 2 July 2007, ie 1 SDR = €1.118960. This article sum 443042 time has been read.